This video is done by Dennis Apel, a Catholic worker from California. Dennis came to our Global Network meeting on Jeju Island in February and put this together. He gives you a quick view of what happened during the trip. In Richmond, California, a city with 17 per cent unemployment, the jobless are turning to 'cooperatives' to create new economic opportunities. Al Jazeera's Rob Reynolds reports. This is the way human beings were meant to work. The economic model of everyone for themselves, dog-eat-dog capitalism is old school. Cooperatives are the real future. Army Private First Class Bradley Manning appeared in court Thursday morning. At the hearing prosecutors accused Manning of aiding the terrorist group al-Qaeda. For allegedly releasing thousands of documents to the whistleblower site Wikileaks, the government has charged Manning with nearly two dozen crimes. As he awaits trial, however, many doubt Manning will receive a fair hearing. According to some reports, the soldier was tortured while he was locked up for more than a year in military custody and some say that PFC Manning was treated worse than a terrorist at Guantanamo Bay. Zack Pesavento of the Bradley Manning Support Network is one of those critics, and he brings RT his latest following Thursday's hearing at Fort Meade, Maryland. Politicians in the U.S. are not used to such tough questioning by reporters as we see here from the UK's Channel 4. It should be remembered that in the 2008 election, when Obama ran against Sen. John McCain (R-AZ), it was Obama who got more campaign donations from the military industrial complex than McCain (the war hawk) did. They play good cop - bad cop with the people's heads but both the Republicans and the Democrats are war parties. 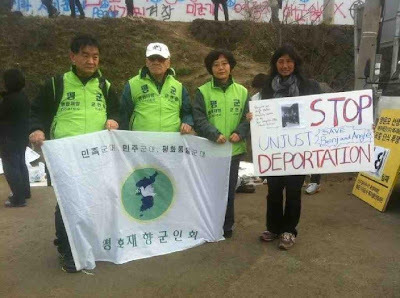 Two members from South Korean Veterans For Peace arrived in Jeju Island today to meet their counterparts from the U.S. who had been turned away yesterday. So the Korean VFP members held a news conference to blast their government for their treatment of their guests. “This is gratitude. I served in Korea with the 2nd Infantry Division defending the people from North Korea, I come back to again defend the people [of Gangjeong] and I am pushed off into no-man's-land,” said Elliott Adams from New York. 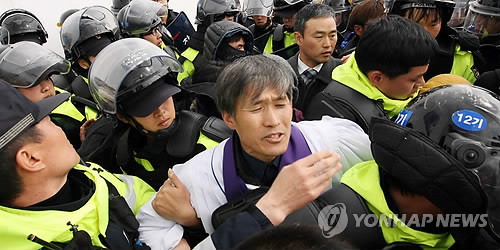 Sung-Hee Choi reports that, "Yang Yoon-Mo is told to stop the fast as of March 15, his 38th day. As his health has become deteriorated, he stopped his hunger strike and is beginning to feed himself with water gruel. He had stopped even water and bits of salts since the Navy’s enforcement of the blast on the Gureombi. But his health was very fragile since more than 70 days’ fast last summer. People in Gangjeong village are glad on the news. Nobody wants him to die for fast." I did a radio interview in Sarasota, Florida today and spent a good bit of time talking about Obama's "pivot" of U.S. foreign and military policy toward the Asia-Pacific. I included much about Pentagon "missile defense" deployments on Navy warships that would be ported in Gangjeong if the base is allowed to be completed and the likely resulting new arms race in the region. Tomorrow (Friday) I speak at 7:00 pm at the Unitarian Church in Bradenton, Florida. U.S. Veterans For Peace members Elliott Adams and Tarak Kauff will hold a protest and news conference on Friday, March 16 at the South Korean Consulate in New York City at 12:30 pm. They are fighting mad and I would venture to say that the South Korean government has just made bad blood with two of the most respected and hardest working VFP members in our country. President Lee, you are going to regret ever denying these non-violent peace warriors entry onto Jeju Island. Your desperate plan will surely backfire now! I had a record of 1,211 hits on this blog today from South Korea. Some of them are from the Lee government (they want to know what we are going to do next) but many are just from interested citizens. My total visits today were 1,917. The most ever in one day. They also came from United States, United Kingdom, Germany, Netherlands, Australia, Malaysia, Canada, Japan, Russia and various other countries. Thanks for visiting and come back again soon. Samsung is the lead contractor of the Jeju Navy base. Samsung has a horrible track record of mistreating and abusing their electronics workers. Send a message to Samsung and the right-wing South Korean government by boycotting this bad corporation. Tell others about the boycott. The US is reportedly threatening India with penalties, if it doesn't comply with Washington's sanctions against Iran. India is one of the biggest consumers of Iranian oil, and American officials are quoted as saying they are worried that India may sidestep payment restrictions. RT's Priya Sridhar is in New Delhi. We've just learned that the three Veterans For Peace members who arrived in Jeju Island, South Korea today were denied entry into the country. Tarak Kauff, Elliott Adams, and Mike Hastie were met by South Korean authorities when they landed on Jeju Island. Tarak and Elliott flew to Jeju via Shanghai, China and Mike from Seoul. The South Korean authorities had a photo of each of them in their hands and told them they would not be allowed to enter Jeju Island. They were instead taken and put on a plane back to Shanghai and San Francisco. When Tarak and Elliott arrived in Shanghai they were told that they each had to pay $280 for the change in flight schedule. But Tarak told the Chinese that they had just been denied entry into South Korea because they were going to protest against a Navy base that was being aimed at China. When the Chinese airline staff heard that they waived the $280 fee for each of them. Tarak, Elliott and Mike are severely disappointed that they will not be able to stand with the people of Gangjeong village on Jeju Island. South Korean members of VFP were planning on flying from Seoul to Jeju Island to meet with the American VFP members. This case though illustrates just how much the South Korean puppet regime fears the growing international movement to support the fight against the Navy base on Jeju Island. The US military is pressuring the right-wing Lee government to build this base that will be used to port U.S. warships that will be used in Obama's military "pivot" into the Asia-Pacific region. Just yesterday Angie Zelter (UK) and Benji Monnet (France) were deported from South Korea after being arrested for protesting against the Navy base. 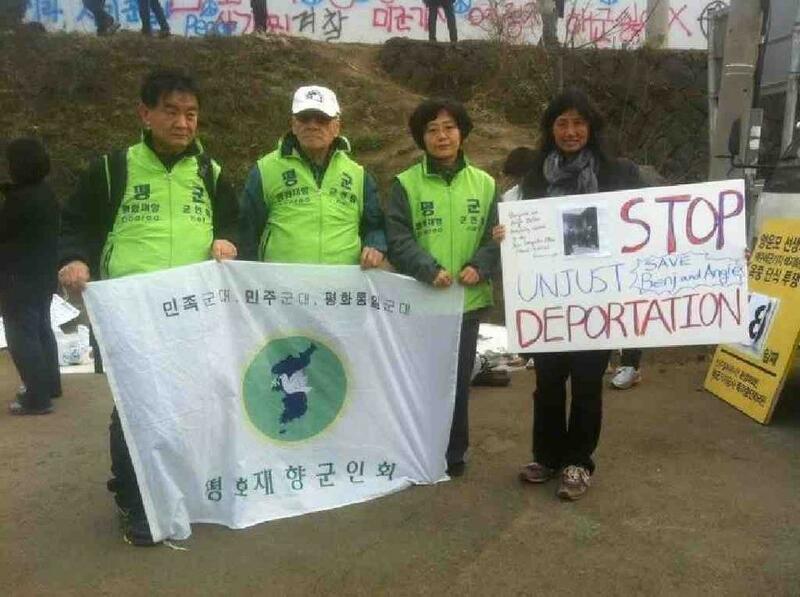 Please help send a strong message to the South Korean government by calling and/or organizing a protest at the nearest South Korean embassy/consulate to your community. Also call the South Korean embassy in Washington DC 202-939-5692 or 202-939-5600 to lodge a strong complaint about them denying the three VFP members entry to Jeju Island. Can there be an question that we are now living in a corporate dominated police state? Please remember too that the South Korean corporation Samsung is the lead contractor building the Navy base on Jeju. Boycott Samsung! We, Tarak and Elliott, just arrived back in the US. When we arrived at the airport on Jeju (we flew in from Shanghai) they were looking for us. They had our photos printed out. They put us right back on the same plane. We do wonder if we could have some how mounted meaningful resistance there in the immigration office, but I doubt it. 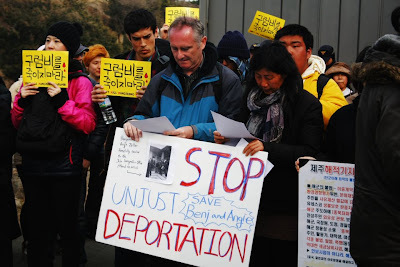 We feel terrible that we are not with everyone in Gangjeong especially after the deportation of Benji and Anne. Mike Hastie got on the plane to Jeju from the mainland and then after a 10 minutes they came and got him off. 6:49 PM Pacific time he was in the detention room in Seoul due to be shipped out to San Francisco at 4:20PM Korea time. They obviously plan to try to keep internationals out of Jeju. We, internationals, need to work to raise international awareness, disgust, and pressure. 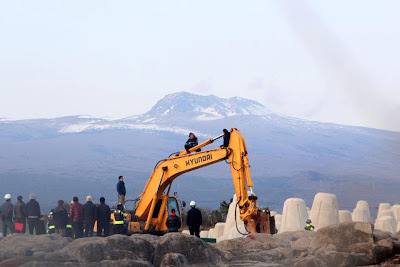 JEJU ISLAND, South Korea, March 14 (Yonhap) -- Police said Wednesday they have requested arrest warrants for two foreign activists on charges of destroying public property during protests against the construction of a contentious naval base on Jeju Island. Briton Angie Zelter is accused of breaking into the construction site in Gangjeong Village on the southern tip of the resort island Friday evening after cutting down barbed-wire fences, according to the Seogwipo Police Station. Meanwhile, French activist Benjamin Monnet allegedly trespassed onto the site and climbed a crane on the same day. The two are the first foreigners facing arrest warrants in the protest against the naval base construction. The project, first launched in 2007 and scheduled to be completed by 2014, has been one of the most controversial issues in South Korea as local residents, opposition parties, and other environmental activists have staged strong oppositions against it. Tensions escalated when the Navy and a local construction firm blew up part of a rocky outcropping known as Gureombi last Wednesday, initiating a key part of the construction work. Zelter, a Nobel Peace Prize nominee, is most notably known for spearheading efforts to tear down the fences around U.S. military bases in Britain in the 1980s. 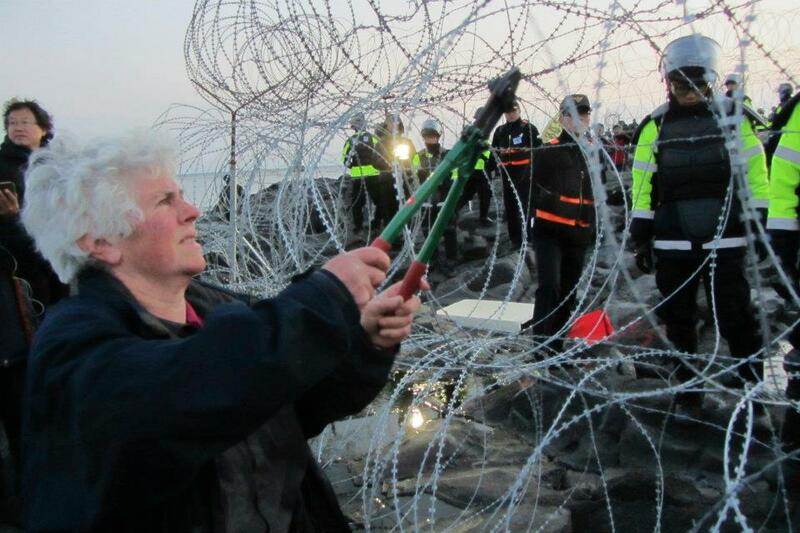 She has been arrested more than 100 times in half a dozen countries during her work as a peace activist. Police also sought a warrant for a South Korean activist, only known by the family name Kim, on charges of obstructing police executing their duties during protests along with Monnet on Monday. Meanwhile, the police said they have released 13 local activists and residents who were arrested on the same day. On Monday, Russian Defense Minister Sergey Lavrov met with US Secretary of State Hillary Clinton to try to come to a resolution on what to do about Syria. Russia and China have vetoed previous attempts by the UN Security Council for intervention that could potentially lead to the overthrowing of Syrian President Bashar al-Assad. 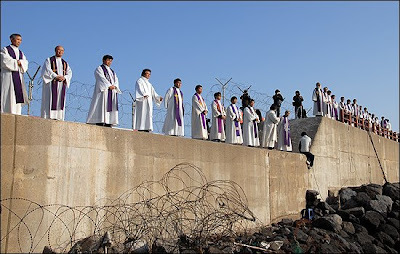 Police detain Song Young-sup, a priest, in Gangjeong Village on the southern tip of South Korea's southernmost island of Jeju on March 13, 2012, as he attempts to demolish a fence for the construction site of a new naval base in the village. The project, which was launched in 2007 during the Roh Moo-hyun administration, has been one of the most contentious issues in South Korea recently as opposition parties, environmental groups and other activists have staged strong protests against it. Catholic priests' association for Justice had its first Monday pilgrimage mass at Gangjeong port at 4 p.m. on March 12 . . . There is a great need to expand international support of Jeju Island protests among various constituencies like women's groups, faith activists, environmental community and more. On March 7, the first blasting the coastal rock, known as “Gureombi” has begun in while the government and the navy exercised its power in Gangjeong village and villagers and peace activists were hauled by the police. There was expected to carry the explosives by land but the navy handled sea freight, not to take the road that were blockaded by the villagers and activists. People who were determined to defend the Gureombi were immensely shocked. 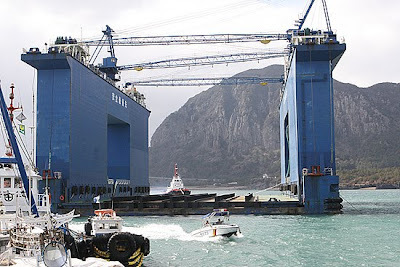 The navy announced that 43 tons of explosives will be used for blasting the Gureombi and it will takes from 3 to 5 months according to the weather. There have been daily nonviolent direct actions and other forms of struggles for saving Gureombi every day since the first blasting progressed. More than 60 people were already arrested and the numbers of arrests continue to occur as well. There has been an increase in cases of police misconduct and human rights frequently violated. Professor Yoon-mo Yang who was arrested for obstructing police in carrying out their duties is now on his 35th day of hunger strike as of March 13 while inside the prison. The Jeju government demanded on temporal reservation on construction but the Ministry of the National Defense didn’t have an attitude accepting this demand at all. 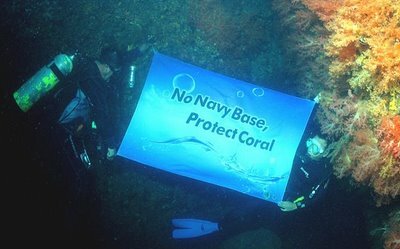 We ask you to support to our efforts to save the Gureombi and resist the naval base on Jeju Island. Take some time to write letters of complaint to the government and the navy planners and please distribute this appeal among your friends or in your local group. This appeal will be updated every week. 1. Call the Korean Embassy or organize demonstrations in front of the Korean Embassy in your country and let them know that Jeju does not want a naval base! 3.Sign the petitions on Avaaz (http://www.avaaz.org/en/save_jeju/?vl), Care2 (http://www.thepetitionsite.com/2/Save-Jeju-Island/) or other online sites urging South Korean President Lee Myung-Bak to stop construction of the military base! After signing please share the petition with your social network. 4. Contact the media in your country about this resistance to raise their awareness about the struggle. 5. Stay updated on the resistance by joining the "Save Jeju Island” and the “No Naval Base on Jeju!” Facebook pages. 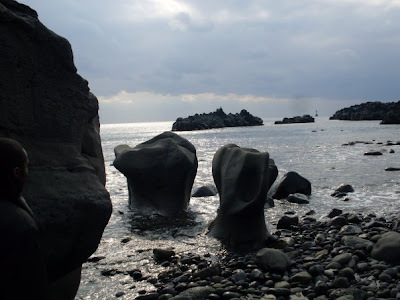 Follow the most recent developments on Twitter at #savejejuisland and #gangjung - then re-post. 6. Consider making a donation to support the international campaign to Save Jeju Island. 100% of your financial contribution will go directly to villagers on the ground waging peace against this dangerous militarization project. As I was sitting here in the Atlanta, Georgia airport and posting on my blog I heard a familiar voice sitting next to me. I recognized it from watching Congressional debate on C-SPAN. 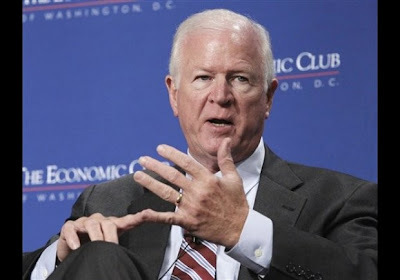 I looked over and sure enough, it was conservative Senator Saxby Chambliss (R-GA). I figured I needed to use this chance to say something about Afghanistan since the newspaper he was holding in his hand had a front page story about the U.S. soldier killing 16 innocent civilians in that war torn country. I introduced myself and told the senator that I am a member of Veterans For Peace. I told him that we needed to get out of Afghanistan right away. He said, "Headlines like this don't help us." But he went on to defend the U.S. military occupation saying that we have to stay until new effective leadership can be developed. He said the people there were not capable of running their own affairs. I asked him how much we are spending there every month and he quickly replied, "Oh, about $10 billion." I told him we need that money back here at home and that what we spend in one year in Afghanistan could cover all the debt in states across the country that are now in the red. He kept saying that we are going to be there a long time - and I again pressed him by asking why we have to stay. Was it China? Was it the Caspian Sea pipeline routes through Afghanistan and Pakistan? Surprisingly he responded that, "It's more about Russia." I told him he was losing the hearts of the American people on this and he replied, "Yeah, I know that is right." I then told him that every criminal has an MO - a modus operandi - and that this criminal syndicate called the military industrial complex has one and I'd seen it in operation since the Vietnam War. At that point he was anxious to move. He thanked me for my service to the country. I responded that I was still serving the country by opposing these current wars. The really good stuff begins at 5:00 minutes into the video. Two activists sit atop of a rock busting machine. Mt. Halla is in the background. A protest high up in the air: 16 people including Benjamin Monnet, Kim Seri and Angie Zelter were arrested in the Gureombi rock. A long day again for many people here in the village. I just came back about one hour ago from the Seogwipo police station to meet the arrested on March 12, including above three in the Gureombi rock. 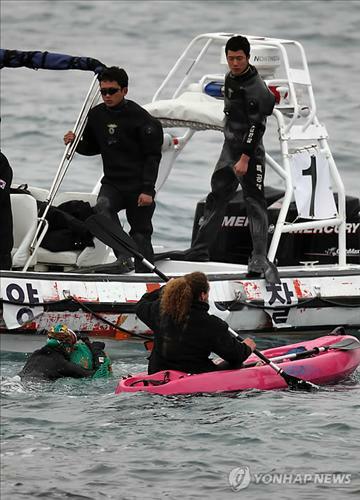 Four people including Dr. Song Kang-Ho have entered the Gureombi by kayaks from early dawn-around 5am and occupied the tetra pods site near the rock, which have also been used on March 7. 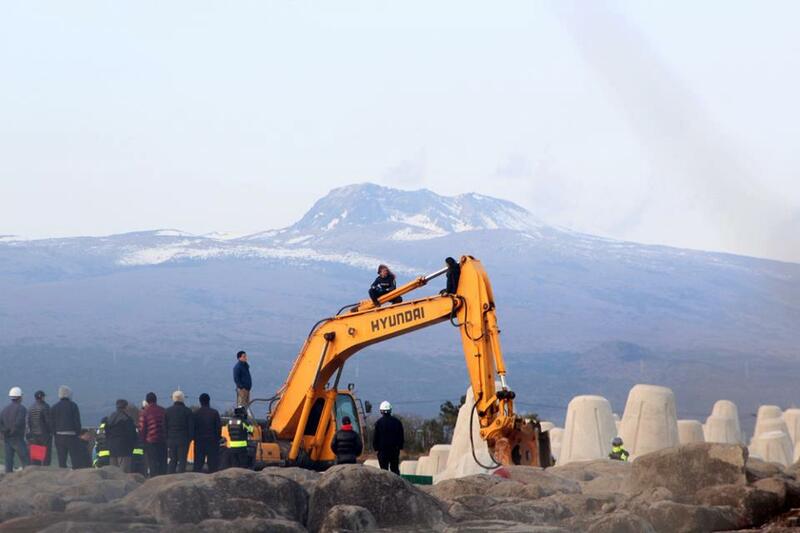 Among them, two people- Benjamin Monnet, a French activist and Kim Seri -climbed up to a crane that had drilled a large area of rock , which started in the afternoon. “I could not stand any more of the crane destroying rocks. So I crawled underneath wire razor. Then a Daelim thug suddenly came to me and pushed me back toward that wire razor. As I tried to enter forward, another thug also pushed me. At the time I hurt in my left leg and left arm (She was limping when she walked in the police station in the night.) One of them severely pressed my neck so when I was on the crane near for two hours later, I found my leg, arm, neck were all painful. But I could not really feel about my body condition when I ran toward the crane from the thugs from whom I wanted to escape. I was just desperate to stop the rock being destroyed. And I saw Benji who had been trying to protect me from such violence was very quickly running passing by me, already reaching to the top of crane before me. He helped me to climb up the crane then. (Benji was also pushed back by the thugs when he tried to protect Seri). The two stayed on the top of crane near for two hours, shivering in coldness in thin swim suits. They were eventually arrested under the charge of ‘obstruction of business', by the policemen who flocked like crows underneath them. According to Seri and Mr. Lim Ho Young, who got information by talking with the construction workers or one’s own research, the site the crane was drilling is where the rock bed is to be eventually blasted after being put with explosives for the formation of caisson-production area, the 2nd work area of 250m length by 70m width size, with the use of 35 ton explosives. (Please imagine how large it is considering that the Gureombi rock is about 1.2 km whole one body.) In the 1st work area where 8 ton of explosives would be used for blast, another crane was working near the coast with strange equipments nearby it and yellow electric codes being laid in inside water. Is if for the blast of the rock bed underwater? Seri wondered. How beautiful Seri and Benjamin are today. For near two hours, thanks to them, the destruction of people’s Greombi could stop, to the joy of people who cheered for them! In the nearby room where Seri was investigated, there was Angie Zelter who bravely cut the wire razor in front of policemen so that about 20 people could enter the Gureombi rock as people gathered into to the coast, risking dangerous files of tetra pods and pitched stone bank to protect the two amidst sun-set. Angie knew she would be arrested again only one day after her release. She has been arrested on March 9 when she has entered through a fence, along with about 30 people, breaking it with others including a pastor Lee Jeong-Hoon and Fr. Kim Jeong-Wook who would be imprisoned soon. Among the arrested today, there were two teenagers –one boy and a girl - who were eventually released hours later. Except for the two, 14 people were eventually carried to the Dongbu police station in the Jeju City to stay night there in its custody room. Some of them were arrested in front of construction gate where they protested against the police’s illegal arrest of people inside the Gureombi that is absolutely public space. Among the arrested, there was Mr. Song Chang-Wook who has been feeding himself only one meal since movie critic Yang Yoon-Mo’s fast. There were many new faces today including a wife of a renowned photographer Lee Si-Woo. She was hurt her head when she crawled underneath a wire razor. Thanks to Save Our Sea team who encouraged people to enter the Gureombi, despite the risk of dangerous files of tetra pods and pitched stone bank, about 50 people could enter to the Gureombi, though 16 people would be eventually arrested, surrounding the uniformed police line inside wire razor with their diverse costumes, talents and songs. The Catholic Fathers held a mass near the port where people could watch what is happening inside the Gureombi. Fr. Moon-Kyun s climbed up to a light house, fluttering his sacred white robe in the wind. A little distant from it, more than 10 young Catholic fathers sat in a line, leading the mass in solemn mode. By the sun-set, the whole Gureombi rock looked happy in long time again with many people cheering and singing there. 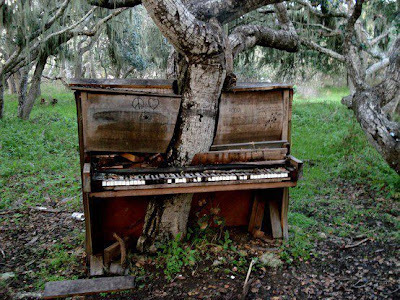 Destruction will go on tomorrow, too. Nobody knows how many arrests and imprisonments would happen tomorrow and coming days. The numbers of arrest since Jan. 2010 is now reaching almost 100. Everyday people here have to endure early dawn siren by which many people have already been suffering for auditory hallucination, confrontation with police, physical and psychological risk, etc. Still more and more people seem to come here. More and more people seem to have concern with people’s beloved Gureombi. As the sun set, the young policemen also sought for their sleep, too. It is for those young people that we fight to inherit them this Peace Island so that they should not be a cannon fodder by a war base here. It is told another 4 blasts happened today, too. I "opted out" of the new high-tech x-ray body scanner at the Portland, Maine airport early this morning. Instead I got the blue plastic glove human pat down, more like a rub down at some points, from a nice TSA worker. He told me he didn't think badly of me for opting out. I thanked him. I told him I didn't trust these machines impact on our health and further more I felt that the government was going overboard with all these security measures. I said it is all over the top. He told me he agreed and I swear at one point he used the word "we" giving me the clear impression that possibly many of his co-workers also agreed. I also went into a bit more detail about how our government is taking our privacy rights away from us. He agreed again. It was the most pleasant pat down I'd ever experienced. This is just one more reason why so many people love living in Maine. It's motto is: The way life should be. Other than finding a bottle of water or my sun screen today, how many villainous acts do they stop each day - and how much does all this "technology" cost the taxpayers. 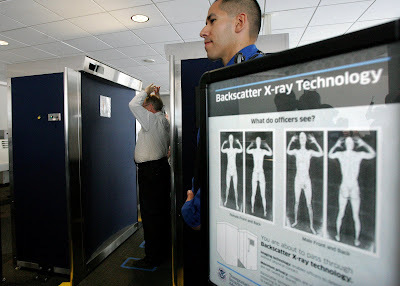 Someone is getting rich off this.....I think the TSA workers should speak out. They have a union - they should use it to inform the people that we are being ripped off. South Korean Novelist Gong Ji-young chimed in on opponents’ arguments against the construction of a naval base on Jeju Island, adding fuel to raging debate over the project. Gong wrote on Twitter “You don’t listen to the Jeju people nor budge at the cutting of the budget by the National Assembly. 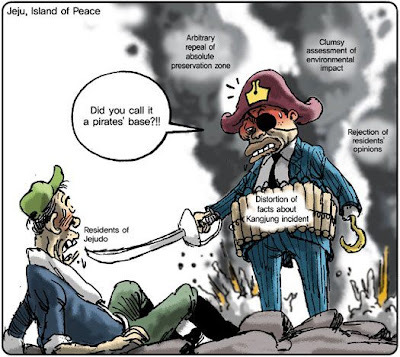 You, who beat innocent citizens and put them into the water, are nothing more than pirates,” referring to the Navy. Her remarks came after proportional representative candidate Kim Ji-yoon of the Unified Progressive Party wrote that she opposed the naval base construction on her Twitter on Mar. 4. Kim went to Gangjeong village and joined the protests when she dived into the water after police would not allow kayaks to be used to get to Gureombi rock. When was the last time you heard a story about a person running for office joining a protest by jumping in the water. She's my kind of politician. I head out early tomorrow for Florida where I will be for the next week. I am meeting my cousin in Sarasota to watch three Baltimore Orioles spring training baseball games. I'll be staying at the home of Maine friends Selma & Hersch Sternlieb who spent the winter there. Selma has organized a talk for me on Friday, March 16 at 7:00 pm at the Unitarian Church in Bradenton. She has also arranged for me to do a radio interview while in town so I should be kept busy. I'll have my laptop and cell phone so can be easily contacted. Once I get home I will have two weeks to prepare for my 30-day west coast speaking tour that will be hosted in 23 cities from San Diego, California to Bellingham, Washington. I am really excited about this trip and have already sent two boxes of newsletters, books, and bumper stickers to early hosts. It was sad and disgusting to hear about the U.S. soldier who just killed 16 innocent people in Afghanistan. This comes on top of the recent burning of the Koran by U.S. troops stationed there. Our military occupation of that country, costing us at least $10 billion every month, is becoming more of a flash point every day. The people in the U.S. need to push hard and call for us to bring our troops and our war dollars home now. Now that the three members of Veterans For Peace are going to Jeju Island I will next start work on getting another group of three people to go there in early-to-mid April. 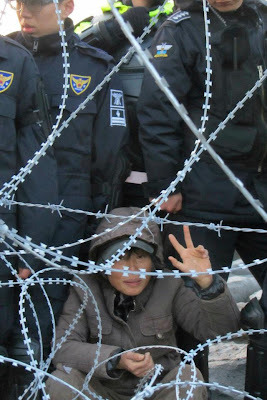 Let me know if you are interested in spending two weeks protesting alongside the Gangjeong villagers. Vermonters went to their town meetings last week to settle questions about local governance. They also decided to take on the corrupt campaign system that is steering the nation toward catastrophe. 64 towns voted that we should amend the U.S. Constitution to overturn the Supreme Court’s Citizens United ruling that said corporations have the free speech rights of people. “The resounding results will send a strong message that corporations and billionaires should not be allowed to buy candidates and elections with unlimited, undisclosed spending on political campaigns,” declared U.S. Sen. Bernie Sanders (I-Vt). Vermonters are not the first to move to amend. Referendums have already passed in Madison and Dane County, Wisconsin. Cities across the country, including Los Angeles, have urged Congress to begin the amendment process. State legislatures in Hawaii and New Mexico have as well. The black president sends U.S. troops to African continent on behalf of big oil corporations. Not much of a response by the liberals. If Bush sends troops to Africa the liberals holler. This is why the corporate oligarchy will ensure that Obama is reelected. Sixteen Afghan civilians including three women and nine children have been shot dead in their homes by a US soldier in a pre-dawn attack. The U.S. government trains its soldiers to be killers. America is one sick nation. Gives an idea why Gureombi rock is sacred to the people - as sacred as the sky, the water, our relatives that live in the ocean, the endangered red crabs that live within the rocks, the plants that live there too. All sacred and good. Who will speak for these relatives? I don't much understand the construction technology used for building Navy bases, but the photo above is a caisson. A bunch of these will be moved from a nearby village port to Gangjeong village to help construction of the base. Today at Hwasun Harbor where the Caisson barge carrier was trying to move, the wind was really strong, strong against the unconscious military base project. The wind and the waves pushed the huge Daelim company barge against 3 fishing boats that were docked at the harbor. Two of the boats sank. Now there is a petrol table at Hwasun Harbor, and none of the authorities were able to contain those leaks. Unfortunately it will create an environmental disaster in the small fishing port.